After a tour of the College of William & Mary, O’Donnell met with the Assistant Dean of Admission, Taylor Stephens, who quickly gave her a path to get involved. Stephens introduced Casey to Global Playground. Inspired, O’Donnell chose to contribute to Global Playground through a ‘legacy project’ in her high school A.P. Literature class. “Global Playground immediately came to mind,” said O’Donnell. The purpose of the project was to inspire students to dream big, leave their mark, and ultimately create a miracle in the lives of others, and O’Donnell did just that. 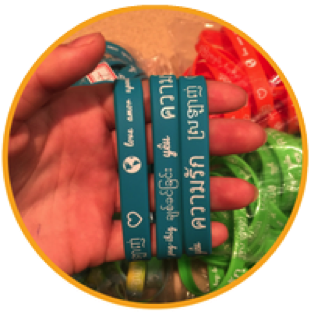 After seeing many people her age wearing rubber bracelets to support different causes, O’Donnell decided selling custom rubber bracelets might be a great way to raise money for Global Playground. O’Donnell designed bracelets with the word love inscribed in all the languages native to Global Playground’s project sites. O’Donnell ultimately raised $352 selling the bracelets, $102 hosting a bake sale, $160 using a GoFundMe page, and approximately $142 via a charity collection through her school’s ministry program. Altogether, she raised more than $750 for Global Playground. O’Donnell hopes the money she raised will further support Global Playground’s efforts to promote understanding and sensitivity across different cultures.